This uniquely comprehensive resource examines women's health through a variety of clinical practice and theoretical frameworks such as feminism, feminist theory, and globalization. 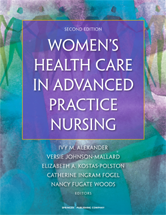 The second edition retains the important focus on prevention, managing symptoms, and health problems that are unique to women. 4. Health Care for Vulnerable Populations - Cooke Cheryl L. and Mohammed Selina A. 5. Legal Issues in Women's Health Care - Small Anna G.
6. Feminist Frameworks for Advanced Practice With Women - Cooke Cheryl L. and Mohammed Selina A. 10. Older Women's Health - Cochrane Barbara B. and Young Heather M.
11. Well Woman's Health - Johnson-Mallard Versie and Kostas-Polston Elizabeth A. 12. Mental Health - Houck Gail M.
15. Healthy Practices: Sleep - Landis Carol A. 16. Genetics and Women's Health - Seibert Diane C. and Kostas-Polston Elizabeth A. 21. Fertility Self-Management and Shared Management - Prior Richard M. and Katz Heather C.
23. Prenatal Care and Anticipating Birth - Ferguson Lisa L.
28. Perimenstrual and Pelvic Symptoms and Syndromes - Wilson Candy, McClure Regina A. and Kostas-Polston Elizabeth A. 29. Urologic and Pelvic Floor Health Problems - Bercik Richard S. and Richmond Cherrilyn F.
33. Gynecologic Cancers - Silko Barbara J. and Heron Leslie J. 37. Infertility - Bender Rachel Oldani and Kostas-Polston Elizabeth A. 38. High-Risk Childbearing - Stone-Godena Marianne T.
43. Cardiovascular Disease in Women - Chasse Mulinski Tina M., Nyström Karin V. and Winkler Catherine G.
45. Chronic Illness and Women - Bertulfo Tara F. and Rashdan Theresa G.